The Ninth Regiment Connecticut Volunteers were formed in New Haven in 1861 with 845 men. Known as the “Irish Regiment” because they were predominantly made up of Irish Catholics, they lost some 250 men during the war. During the worst stretch 150 men died in a four month period starting with an ill conceived attempt to dig a canal connecting a loop in the Mississippi River that would allow Farragut’s fleet to bypass the Confederate cannons stationed high above on a bluff at Vicksburg. Poorly equipped, the swampy conditions in the July heat quickly took their toll on the men as malaria and dysentery spread rapidly. 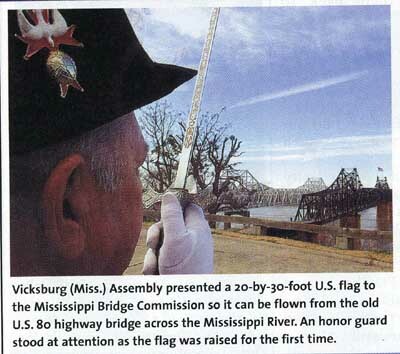 The Vicksburg National Military Park, run by the National Park Service, currently has nearly one million visitors a year with over 1,300 memorials, signposts and monuments from 28states as well as the country’s largest Civil War cemetery, the resting place of some 17,000 Union soldiers. Not one of the monuments mentions the Ninth or Connecticut. In the 1990s the United States Senate passed legislation to expand the official timeframe of the Vicksburg campaign to include the canal activity and to authorize the NPS to take ownership of land at the canal area. As a result we have received an invitation to place a Connecticut monument honoring the men of the Ninth. A letter from Governor Rell authorizing us to proceed with a monument on behalf of the State of Connecticut has been received.On behalf of three sponsoring historical societies in the New Haven area a preliminary design has been developed and fundraising started. A letter from Supreme Knight, Carl Anderson, expressing an interest in contributing to this project and asking to be informed of further developments was received in 2003. 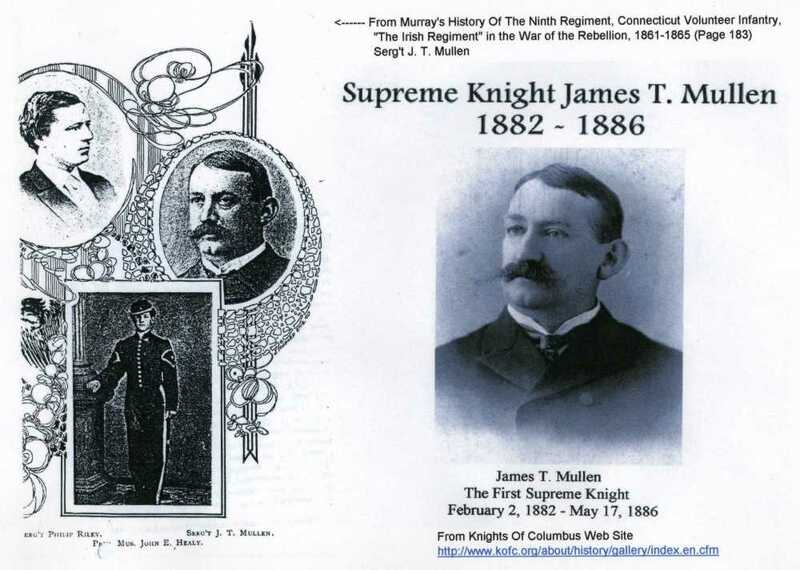 James T. Mullen, a Sergeant in the Ninth who was discharged due to illness in December of 1862, later became the very first Supreme Knight in the newly founded Knights of Columbus. I also found that he was in the same company as my g-g-grandfather who died at the canal area in July of 1862. I am sure that many of the survivors and relatives of the Ninth, who were predominantly from New Haven, were early members of the Knights of Columbus. In 2006, the Knights of Columbus pledged a total of $10,000; $5000 when the monument design is approved by the National Park Service, and $5000 when the monument is installed.